Safe to use in child and pet environment. Quick humane kill. Battery operated. Requires 4x AA batteries not included 84841 . 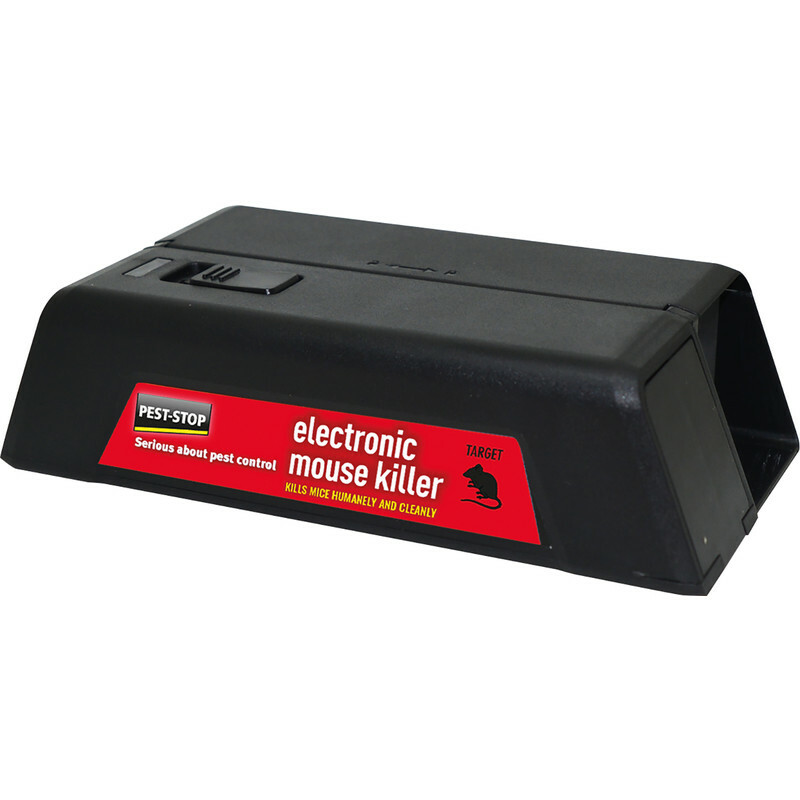 Pest-Stop Electronic Mouse Killer is rated 3.9 out of 5 by 12. Rated 4 out of 5 by Amelie3 from Effective We had found we had mice and things got out of hand when we started hearing their noises in our bedroom. We´d tried the live capture type but they were hit and miss although we caught 2. But after reading some articles on-line, I realised that releasing the mice miles away from home might have only been condemning them to death by starvation so probably not a kinder option after all. We are animal lovers and have a toddler and 2 pets so I wanted something safe for them while being as fast and pain free for the mice. About 12 hours after installing in the same place they had been feasting in peanut butter in the erratic live capture one the light started flashing. My heart skipped a beat due to the weight and we decided to check (I know some people dispose of the victims without checking) as I feared a rat was inside. It was not the case but 2 tiny mice that had probably venture in together. The trap was in our room and we had not heard a thing so I can only assume that it was very fast. We had already blocked all the holes from inside our walls to block their entry and had found a dead mouse in the kitchen (suspected heart attack when we found out his escape was blocked?) so after these 2 fell in the gadget we have not found or heard any more. It definitely did the job and I am relieved knowing we can use it again if need be although we are trying our best to prevent them from coming in in the first place. I think it is woth finding out what they like to eat (peanut butter mixed with grated cheese worked a treat in our case) before setting it as it is a narrow entry so they really have to want the bait to venture inside. And find out where they are coming through to find the best place to position it. Also worth putting a sticker or something blocking the rack at the back otherwise they can help themselves from the outside (as another reviewer had noticed!). I bought this on-line and collected within the hour as my husband was away on trip and I was desperate to try it so a very smooth purchase and ultra fast collection service. Rated 5 out of 5 by chrisbaildon from Does what it says Bought due to a problem in our loft where we had little visitors and caught it within a couple of days and worked exactly as it should. Rated 5 out of 5 by John46 from No mess Very nice clean and efficient item that dispatches the little rodents quick and easy. Caught my first mouse within 24 hours with tablet little help from nutella as I don't like peanut butter! Rated 5 out of 5 by Aid1978 from Excellent! Worked perfectly! Had tried all baits and traps to no avail. Popped this down and caught the mice within the first night! No more mice!! Rated 5 out of 5 by IWRLTD from RIP Mice The mice were running right by the standard mouse traps. This electronic zapper stopped them dead in the tracks. If you have pesky mice this is the one for them. Rated 5 out of 5 by PDsom from Expensive but it works with minimum fuss Bought for a specific problem. It was expensive but it was easy to set, use and to dispose of the dead mouse.